First time I heard KPRM was in the early 2000s, apparently running day power overnight. No response at the time, despite a number of reports. 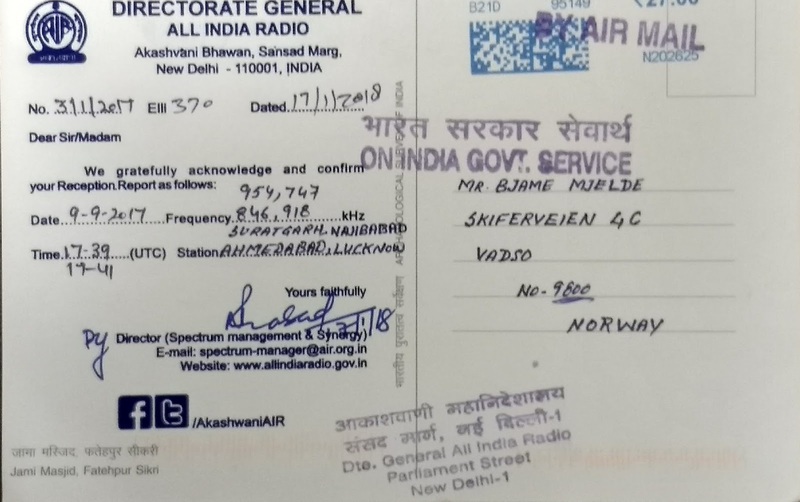 In November 2017 another good signal, and another report was sent. After a couple of follow-ups, a brief response came last night. WARR surfaced briefly through WWKB one evening in early January, probably running their Critical Hours power as it was 45 minutes after Warrenton sunset. It took a while for a confirmation to show up, but then I received a brief email today. This Spanish-language NYC station is heard from time to time, and I got a nice ID one morning in January, fighting with the Puerto Rican. Friendly response from the CE today, thanks Patrick Willför for v/s. 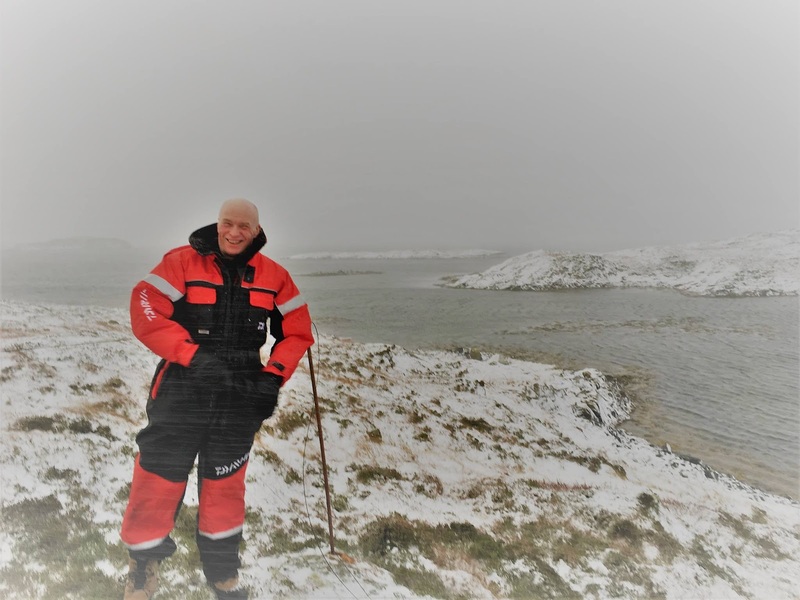 WWMI "1380 The Biz" surfaced with a very good signal one morning in mid-February at the Smøla island location. Short but friendly email response today. Florida # 25. January 19 was a good day for east coast US stations at Smøla island. Mixing with other stations on 1410, WDOV surfaced with a legal ID. Delaware is the most elusive of all US states in our area, and it was a great pleasure to have another DE station confirmed (WILM-1450 a few years ago). Thanks OJ Sagdahl for spotting it. Thanks again to those who support the KongSDR. The reason why the Costs column vary, is that I swap between capacity subscriptions depending on usage. "Thanks again for your email. You made our day!!" This was the response from WKLQ "Big Talk 1490" to my reception report. Heard in the end of January with quite a good signal level at the top of the hour ID. The last of the CBC Newfoundland stations was confirmed today. Heard with local morning programming produced in St. John's, but aired in the Bonavista area roughly 100 km to the north of the province capital. So, that makes eight AIR stations confirmed in two days. Total MW count from India now is 23, up from one at the start of the season (AIR Bhuj 1310, in 1976). 41 years with not a single AIR MW report. I'm catching up quite well. It was a long-awaited catch in January, and a much appreciated QSL today! The signal was quite weak, but I got two distinct "WSTX" announcements, and that was enough. 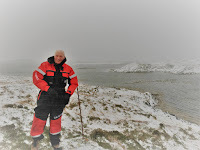 I sent along a picture of me at the Smøla island beach, and got a Virgin island beach in return. Guess which is which! I logged these stations with good signals during auroral conditions in early September. All with local ID at around 17:40 UTC. 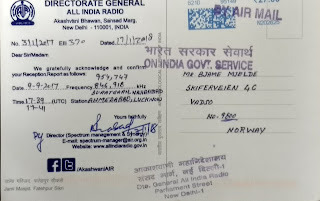 QSL card with all four stations listed was received today.